Proclus (d.485 CE) was the most prolific and influential of the Neoplatonic philosophers to write commentaries on the works of Plato (d.347 BCE), and his commentary on the Republic is the only sustained treatment of Plato's dialogue to survive from antiquity. This three-volume edition presents the first complete English translation of Proclus' text. Unlike most of the Neoplatonic commentaries, Proclus' work is actually a series of essays on what he took to be central themes in the Republic, and each of these essays is annotated with notes and introduced by a separate interpretive essay by the editors. 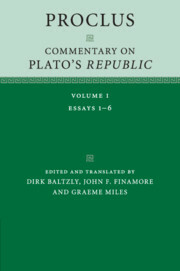 There is also a general introduction that argues for the unity of Proclus' Commentary and orients the reader to the use which the Neoplatonists made of Plato's Republic in their educational program. Each volume is completed by a Greek word index and an English-Greek glossary that will help non-specialists to track the occurrence of key terms throughout the translated text.